The average person today spends about 90% of their time indoors and receives about 72% of their chemical exposure at home. Seemingly counterintuitively, the air in buildings such as offices, schools, and homes can be up to 100 times more polluted than outdoor air,with contaminants such as mold, particulate matter, and chemicals infiltrating what surely many of us thought to be a clean space. These contaminants are not just limited to industrial or commercial settings, and often arise from household products or due to the nature of living in closed spaces. They can spark a slew of health concerns, prompting the Environmental Protection Agency to rank indoor air pollution as a top-five environmental risk to public health.Regulating the temperature, ventilation, and humidity of our homes not only increases personal comfort, but can prevent poor indoor air quality and its associated health concerns, making properly maintained HVAC systems a vital aspect of preserving a healthy home life. HVAC, or heating, ventilation, and air conditioning systems, aid the regulation of indoor environments by controlling humidity, temperature, and airflow through both air circulation and filtration within the home as well as the introduction of outdoor air into it. According to NPR.com, the use of early HVAC systems started in 1925 as a way to get people to come to the movie theaters to escape the summer heat. The layer of frost I observed on the edges of some air vents during one visit to the theaters leaves me wondering if they’ve gone a bit overboard, but nevertheless the trend stuck and HVAC systems are now found in about 82% of buildings. In addition to comfortable temperatures, the circulation of air provided by HVAC systems increases the amount of outdoor air coming indoors, while removing or diluting contaminants from both indoor and outdoor sources. This leads to oxygen replenishment, more even temperatures, lower humidity, and the removal of smoke, dust, odor, mold, airborne bacteria, and gases such as carbon dioxide. Without proper HVAC air regulation, air pollutants can thrive and take their toll on your health. The American College of Allergy, Asthma & Immunology states that a whopping “50% of all illnesses are caused or aggravated by poor indoor air quality”. Headaches, fatigue, problems concentrating, skin rashes, ear infections in children, and irritation of the eyes, nose, throat and lungs can all be provoked by contaminants in the air. If moisture levels go unchecked, dangerous molds and mildews can grow, leading to the release of thousands of volatile organic compounds (VOCs) and particulate matter and potentially sparking the spread of bacteria and viruses. Certain chronic issues such as asthma are linked to air quality, where contaminants such as second hand smoke, dust mites, and particulate matter can worsen symptoms. Prolonged exposure to poor air quality has even been linked to life-threatening conditions such as heart and lung disease and cancer, and increased risks for Sudden Infant Death Syndrome. In addition to pollutants encouraging illness, some can be downright dangerous by nature. Combustion pollutants, such as carbon monoxide and nitrogen dioxide result from improperly ventilated appliances such as wood and gas stoves, fireplaces, dryers, water heaters, and space heaters, posing a potential physical hazard of frightening proportions. An important part of reducing these contaminants in the air is through not using or allowing them to be released into the air in the first place. However, this is often easier said than done, as many household products and activities which contain and release chemicals and particulate matter can be hard to avoid, or it may be difficult for homeowners to be aware of the dangers they pose in the first place. Cleaning products, furnishings, and common activities such as painting, paint stripping, cooking, and crafting hobbies are a few common culprits. Other contaminants may be largely out of a homeowner’s control, such as building materials, molds, and moisture conditions prone to the area in which a residence was constructed. 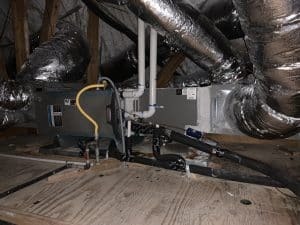 It is virtually impossible to eliminate mold spores entirely, making HVAC systems the best way to reduce their impact on indoor air quality, as well as the impact from other products and activities without needing to give them up altogether. While having an HVAC system in place in your home is certainly crucial, this alone is not sufficient to guarantee the highest possible indoor air quality of your home. Proper model, size, installation, and maintenance over time of the system must be considered in order to maximize health benefits and value. The square footage, building design, and building efficiency all affect the efficiency and necessary size of HVAC systems. Homes with unusual designs or specific activities regularly performed which may affect indoor air quality should take these factors into consideration, potentially giving certain areas of the residence special attention. Additionally, many ventilation systems are not designed to bring in much outdoor air, instead recirculating the indoor air which has already been heated or cooled. This strategy may be effective for minimizing energy costs and appear to be more efficient, but it can negatively impact air quality within the home. Higher quality HVAC systems may come at a higher price, but they are more powerful, require less maintenance, and last longer while providing higher air quality for a healthier lifestyle. As an HVAC system ages, it is important to properly maintain it for preserving performance standards as well as preventing more costly breakdowns and overly high energy bills caused by the system working harder than it needs to. Certain months in particular, in the height of summer and winter, can put quite a bit of stress on HVAC systems, so regular maintenance in between these times can prevent emergency breakdowns when they are needed most. Technicians who specialize in HVAC should be called in to ensure adequate attention is paid to all parts of the system. That being said, some basic steps can and should be taken by homeowners as well, such as being sure to periodically clean filters and check for leaks. Unclean HVAC systems can actually become breeding grounds for mold, dirt, and bacteria, causing them to only make the problems which the system is meant to solve worse. Every small step in maintaining an HVAC system prevents larger failures and provides clean air for your home. Spending the majority of our time indoors is a reality for most people in developed locations, and doesn’t have to be something negative. It protects us from the elements, keeps us comfortable, and with properly maintained HVAC systems allows us to healthier lives in the comfort of our own homes.